Supreme Mixed Corn is an appetising blend of English wheat and cut maize plus tasty extras chosen for their appeal to the bird as well as their nutritional benefits. Black sunflower seeds also contain essential fatty acids and supply the important antioxidant, vitamin E, to support good health and immunity. Oyster shell is also included, which dissolves in the digestive system to provide additional calcium to aid egg shell integrity and support strong bones. Naked oats have been added as a low fibre energy source and are high in good quality protein, supplying essential amino acids for feather and egg production. Soya oil is used to coat the mix, supplying additional fatty acids for egg production and plumage. Split peas are particularly beneficial, being high in protein and popular with birds of all sizes. Feed at a rate of no more than 28g/1oz per bird per day in addition to the recommended amount of a fully balanced diet, like Fancy Feed Layers’ Pellets. 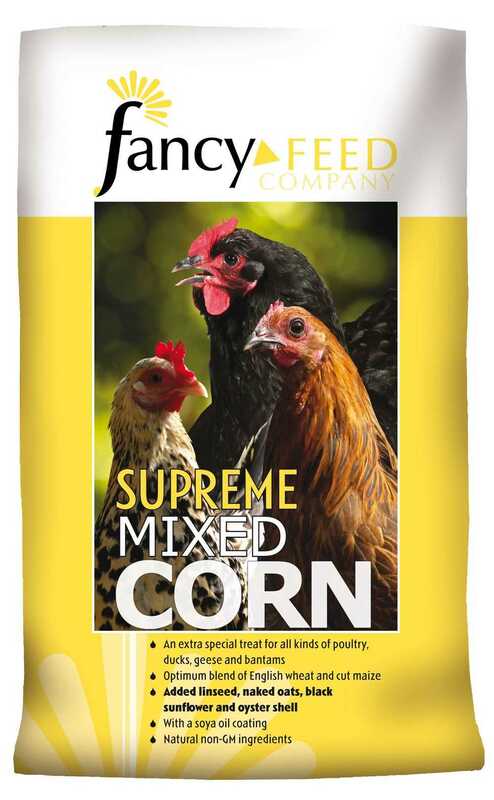 Offer Supreme Mixed Corn after the main ration of pellets or mash has been fed to ensure the birds do not fill themselves with it in preference to the fully balanced food. Ensure fresh clean water is available at all times. Wheat, Cut Maize, Naked Oats, Linseed, Oyster Shell, Black Sunflower Seeds, Soya Oil.